Advertsings your Business. 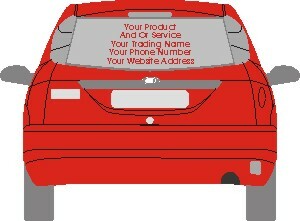 Products or Services on the back window, bumper or boot of your car or van with a self adhesive vinyl sign is a simple very cost effective way of promoting your business, product or service and providing your contact information 24 hours a day and 7 days a week while you are driving or parked. Advertising on the back of your vehicle complements signs on the side of your vehicle and making it easier for your contact information to be seen while on the move. Depending on your requirements you can have a single line self adhesive vinyl sign either for use on the inside or outside of the rear window, the bumber or the boot. The text can be customised to suit your message. For example as a website address, or any other message you require to convey. Fonts and Colours can be as required. Generally for rear window signs white is the most easily seen. For bumper and boot signs, colours can be to suit your vehicle colour. When you make payment please include a note or email the text you require,if the sign is to be mirror cut, and the colour required.